Between the Taurus Mountains to the north, and the sandy beaches of the Mediterranean coast, much of the district is surrounded by a flat plain. This is mostly fertile farmland and agriculture is well-developed in Manavgat, keeping livestock and growing crops including grains, sesame and many fruits and vegetables; in recent years olives have also been planted. There is no industry except for food-processing, so apart from agriculture the local economy depends on tourism. The mountains are covered with forests and typical Mediterranean shrubs, there are small plains higher in the mountains too, traditionally used for summer grazing by the yörük nomads. 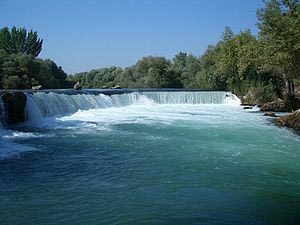 Manavgat has a Mediterranean climate of hot, dry summers and warm, wet winters; the temperature rarely drops to freezing. The district is irrigated by the Manavgat River, and has two dams for hydro-electric power. In 2001 plans began to export water from these reservoirs to Israel and other Mediterranean countries including Malta and Cyprus; as of 2006 these plans are on hold. The ancient cities of Side and Selge date back to the 6th century BC. Manavgat was taken over by the Seljuk Turks in 1220 and the Ottoman Empire in 1472. With 64 kilometres (40 mil) of hot, sunny coastline, much of it sandy beaches, with a long river and the waterfall, well-protected countryside including mountains and forests, Manavgat has an important tourist industry. There is plenty of accommodation on the coastline and many places to explore including historical sites, rivers, streams and caves. And there is the sea itself including the odd experience of swimming from fresh water into the salt sea at the rivermouth. Predictably the cuisine includes fish from the Mediterranean. The huge influx of visitors every year is changing the shape of traditionally conservative Manavgat considerably; there are bars, discos, and all kinds of youth culture which 20 years ago would have been unthinkable. The villages of Kumköy and Ilýca on the coast are particularly lively. The town of Manavgat has grown rapidly and chaotically, mainly with cheap apartment buildings, and the roads and other services are struggling to keep up. While keen to exploit the opportunity to the last cent, the people here are resisting the effect of foreign visitors on their traditional lifestyle as much as they can.